As Star Wars VII (The Force Awakens) is readied to be released I imagine J J Abrams patrols the corridors trying to stop this sort of scenario where a rogue Jar Jar Binks may be added or other unnecessary CGI. 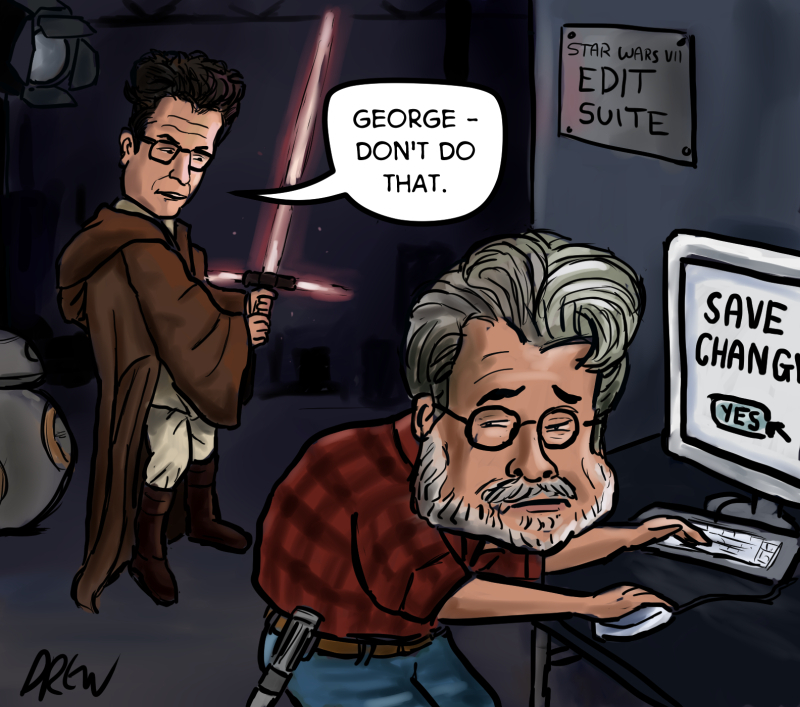 I do have hope for Star Wars VII but anyone who lived through the Phantom Menace has been scarred and is just holding back until we see it. I have done other cartoons about Star Wars VII including the Spheros BB8 toy and the state of the corridors in the mucky Millenium Falcon. 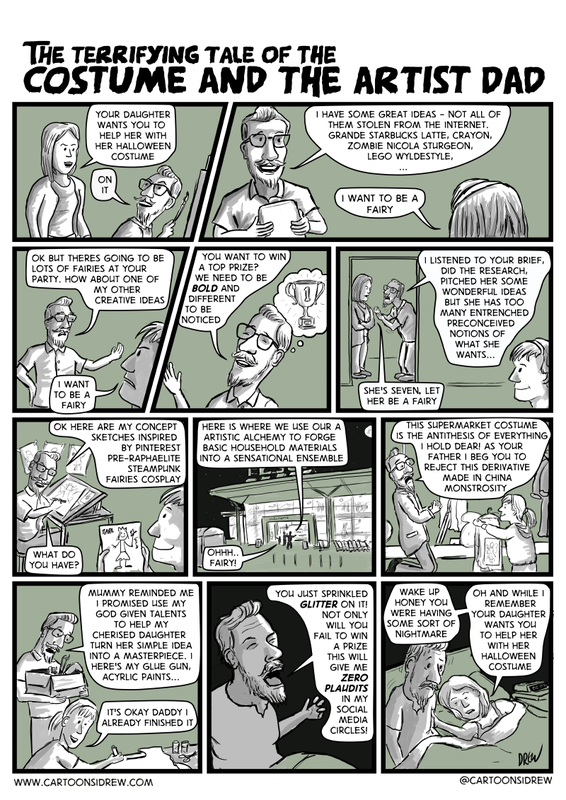 Here is the scariest tale I could imagine as a creative based on my experience of trying to steer my children towards what I would like to make so I can share it on social media. If you liked this story you may like Kitchen Ronin the story of Samurai kitchenware. 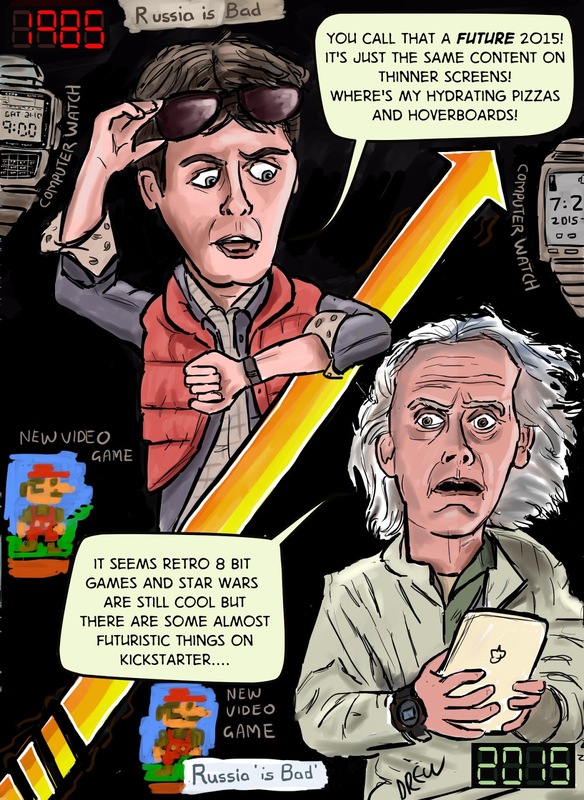 Here comes the sequel to my Back To The Future Day cartoon for the CCGB competition. I'm hoping BTTF buffs get the references and it gave me a chance to sketch the current state of the art hover boards which don't hover (the ones that do actually hover need a certain surface to hover over). 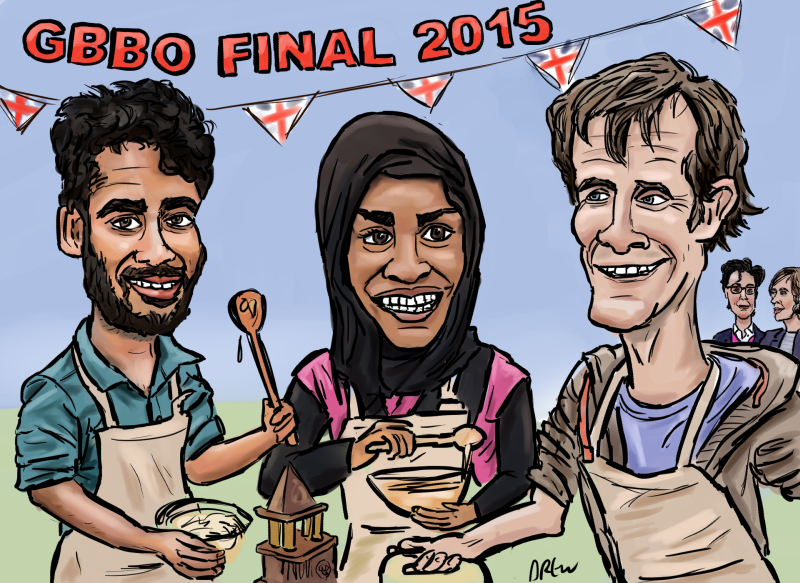 I know it's finished now but I wanted to post my GBBO final caricature here with Dr Tamal, deserved winner Nadiya and "new man" Ian who has the same hair style as me. 13.4 million viewers watched it making it the most watched TV programme of 2015 so far. 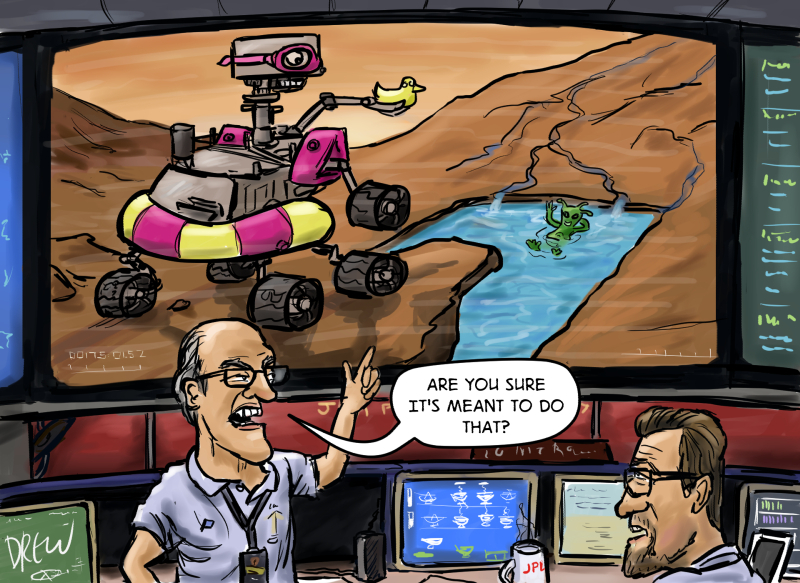 Last Monday NASA announced they had found evidence of liquid water flows on Mars today and being a lazy topical cartoonist I have drawn something nearly a week later. What NASA announced after teasing a "major mystery" of Mars had been solved is strong evidence that dark streaks on the surface are likely caused by seasonal flows of water. This was discovered by studying dark streaks on slopes (known as "recurring slope lineaeae" or RSL) that were seen to come and go in the Martian summer. The Mars Reconnaissance Orbiter used its Crism instrument to analyse the chemistry of these streaks using spectroscopy and detected hydrated salts. So not direct detection of water but a strong indication that salty water is flowing on Mars. However NASA's Curiosity Rover won't be heading over to investigate because even if it could climb the steep slopes it has not been sterilised to the correct degree to be allowed into any areas where life could exist for fear of contamination. 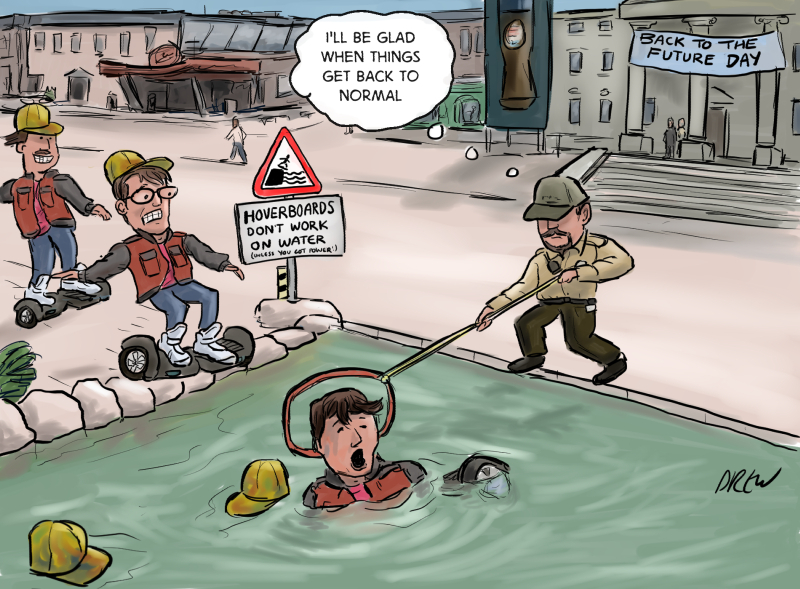 So the scenario painted in this cartoon will probably not be allowed if there was deep water, aliens and a supply of swimming aids on Mars. If you liked this cartoon I have had other space toons on the reality show that is Mars One, Voyager 1 not leaving the Solar System and the future of NASA's manned spaceflight.